It snowed in London. 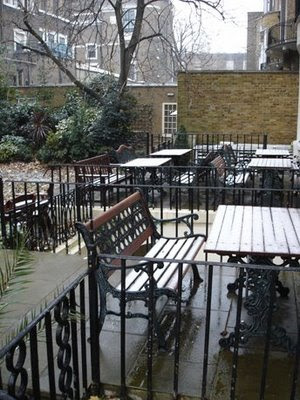 The flakes were not large but they were enough to cover park benches in Russell Square(see photo below). Having just spent two weeks in the UK the cool climate proved to be a welcome change from the stickiness of Singapore. The fourteen hour flight from Changi to Manchester airport was long but relatively pleasant as only "cattle class" in a jumbo jet can be. I confess to some nerves as the BA flight turned out to be a code share arrangement with Qantas who have developed the nasty habit recently of having major maintenance instances enroute. Fortunately this proved not to be the case on our flight. Being a night flight I popped half a sleeping tablet and slept a good six hours enroute. It is the only time I take such medication but is an old trick learnt from businessman who was a frequent flyer. I had expected dark satanic mills so it was a pleasant surprise to note that the streets were wide and the environs more modern than my original expectation. Manchester was primarily a business destination for me so I saw little of it, except for a guided tour of the Manchester United facilities at Old Trafford, where my conference was being held. ManU. is a spartan but impressive set up behind the scenes. One of the more interesting challenges they have is to get the grass to grow. Large light banks resembling irrigators roll around the pitch on wheels, attached by an umbilical heavy duty power cable. This deployment encourages photosynthesis although the swath still looked patchy to me. The Macdonald Manchester Hotel has much to commend it with large modern rooms and appointments. It was here that I sampled once again that great British staple, fish and chips with mushy peas. I also renewed my acquaintance with another English breakfast delight - the black pudding. This was not such a pleasurable experience and I only sampled it on one occasion. After three days in the north of England we flew south to the capital. London was drier and more mild on the day of our arrival. The Grange White Hall Hotel is located in Montague Street, Bloomsbury and is a typical Edwardian styled establishment. The hotel's web site praises its "sumptuous comfort" but that is stretching credibility. It has great location with a short stroll across Russell Square to the Tube and the No.7 bus from Oxford Circus stopping a few yards down the street. The rooms are clean but 'compact' as most London hotels of this vintage are. The staff are all of foreign nationality, friendly and helpful. The exception was the Japanese room cleaner whose poor grasp of English saw her recycling our wet towels back on to the room racks, despite the fact that the written room instructions clearly requested that guests place dirty towels in the bath for collection. She was under the mistaken impression that towels in the bath meant that we did not want to change the linen so she dutifully hung them back up. Heating was provided by water filled radiators which meant that we slept with the windows ajar to avoid suffocation. I walked into Trafalgar Square each morning with business colleagues who were staying in our hotel and it was a pleasant experience striding through Convent Garden and weaving our way through small back streets. As stated above, the weather was variable from milder temperatures to the odd snow flurry but a good coat, scarf and gloves saw us well protected. With the onset of winter is got dark early in the evening but by that time we were safely back in the hotel. During the weekend I visited the British Museum which backed on to our hotel. This was my second visit and it proved as popular as ever with tourists who crowded around the Rosetta stone and other treasures. Not that one could actually see the Rosetta Stone as a Chinese tour group had surrounded it and were taking turns posing for pictures. Their behaviour was as usual boorish. The Museum had a series of modern sculptures in it galleries (see image above) and a gilded Kate Moss posed as a contortionist was a crowd favourite. I would like to think that she did not have to pose for the artist in the course of its making. The other trip highlight was the mulled wine and lunches at nearby The Plough pub, a friendly establishment in Museum Street. See the photos in this gallery. The Vicks inhaler was rammed up his left nostril. His eyes were closed in a feigned slumber as the rhythm of the MRT lulled the passengers bound for Redhill. What at first glance seems slightly incongruous becomes less so the longer one lives in Singapore. Sinusitis is a significant problem in this part of the world. There used to be an advert shown on New Zealand television that extolled the virtues of a preparatory medicine. It guaranteed that by taking the product one would "send your sinuses to Arizona". This is one reason I have never had an inclination to visit Arizona. I also now believe that the geographic accuracy of the advertisement's claim leaves much to be desired. Most of the sinuses ended up here in Singapore instead. Much of life takes place in an air-conditioned environment and maintenance of these units should be, but is not always, a priority. The result is nasal congestion. Similarly, the advent of green awareness in Singapore has seen more people switching off their "aircons" and going back to more energy efficient devices such as electric fans. Not that this alleviates the allergies. Dust and other pollutants are simply distributed in a different manner and pollution is a problem here, especially so when the Indonesians decide to ignore their neighbours health and fire half the countryside. With the current focus on heritage matters in this country what an opportune time to revert to that stalwart of colonial times, the 'punkah wallah'. 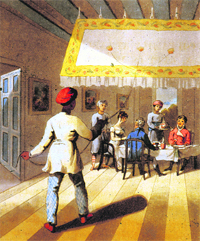 The humble bearer pulled a cord that in turn gently raised and lowered a canvas flap, generated a breeze within the house. This might be just the thing to re-employ the dozens of foreign workers that will be sent home as a result of the downturn in the Singaporean economy. There is however one serious flaw in my labour redistribution plan. While the colonial bungalows of old Singapore could easily revert to this system of cooling, most of us now live in high rise condos or on HDB estates. The small balconies outside where the airconditioning units are perched were never designed for a squatting and loin-clothed figure pulling listessly on a grimy piece of string. Until they solve this architectural challenge I will snuffle my way to the chemist for another inhaler refill. The libido of Singaporeans has been in the headlines again. This is not a new topic as the government grapples with how to encourage Singaporeans reproduce themselves at a faster rate than they are at present. Perhaps I should qualify this by saying it is really certain sections of society that are not doing their bit to grow the population. From what is reported in the papers the Malay population is doing rather nicely but the Chinese are lagging behind. It has now been revealed that the sperm count is part of the problem. The solution, a band aid of testosterone, although the media doesn't report which part of the body this aid should be adhered to. Could it be that the years of compulsory military training under the hot sun have been a contributing factor to the lack of libido? A combination of tightly fitting uniform and exhausting humidity would be enough for any self respecting sperm to call it a day. Apparently and in a more serious vein (if you will excuse the pun), burn-out and obesity are significant contributing factors. Whatever the cause, one in five Singaporean men are suffering the effects which are striking the male population in their mid forties rather than the expected sixties. Better news this week from an expatriate New Zealander's perspective, is the change of government in that country. I am particularly delighted to see the demise of New Zealand First and its leader Winston Peters. This right wing group had actively sought to alienate Asians from society and played to the baser instincts of older generations and the insular-minded who feared that they were being overrun by 'foreigners'. Thankfully Singapore does not entertain the ridiculous MMP system of representation, which sees minority parties having power over policy development well beyond the realities of their election results. In short, a small party can hold a major party to ransom and there is little stability - an essential building block for a cohesive and prosperous society. A contributing reason for my leaving New Zealand two years ago was the political environment at that time and I now look forward to seeing what a National government under John Key can do.